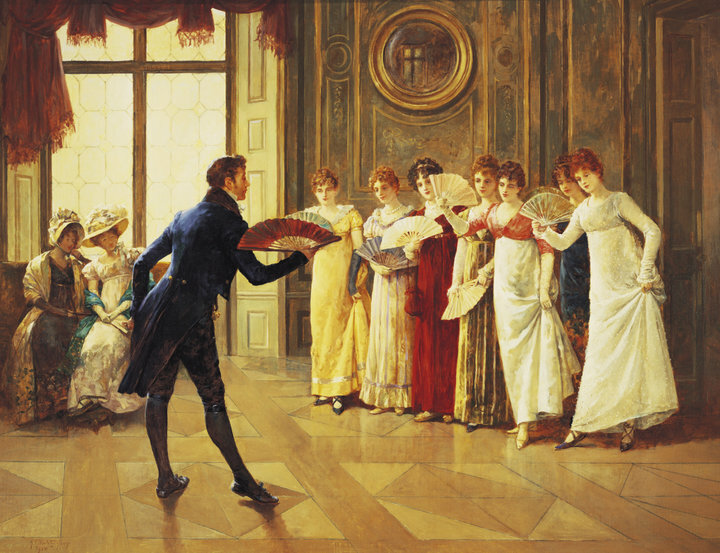 The French Touch: What Price Politesse? Which is why children of my generation were encouraged, by whatever means our parents deemed necessary, to master the gentle, much less taxing, art of politesse. In fact it was an integral part of our upbringing. You were expected to know the rules and the niceties that went with it. Any infractions were dealt with harshly. There were lessons to be learned here – hard lessons that went against the grain of the egotistical, self-absorbed child, which is the way we all start out. After a time it became so much a part of you that you didn’t have to think about it. You never wasted a moment’s reflection on whether or not you were being nice, you were being polite and that’s all that mattered. It was so ingrained in you that you couldn’t help yourself. It was a reflex. The thank you note was in the mail before you even realized you had written it. The condolence call was paid as soon as you heard of the bereavement. You never asked yourself if you had the time, you just did it because it was the polite thing to do. Being nice had nothing to do with it. 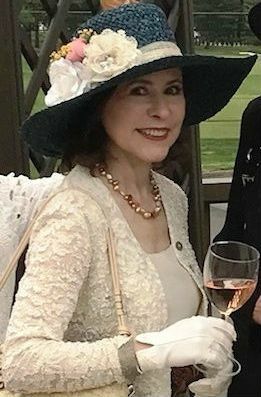 Although I still cling stubbornly to the values and mores of a gentler, more refined time, it has not escaped my notice that, however much I would wish it otherwise, manners and etiquette have generally gone the way of corsets and corsages, not that I ever wore a corset. My grandmother’s generation did. Mine was more the girdle generation, which I didn’t wear either (I wore a garter belt to hold up my stockings). But I digress. 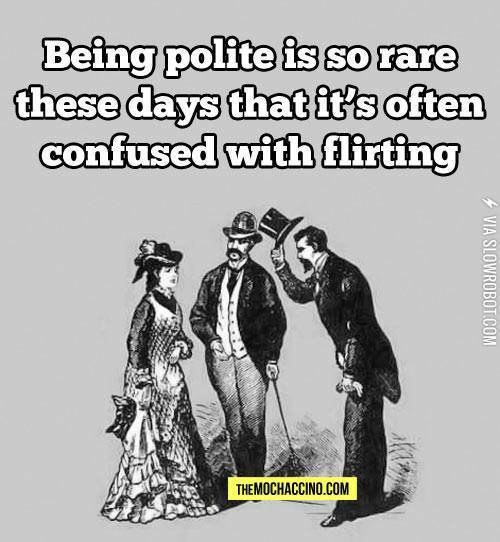 The point is, if you are polite and have bothered to cultivate manners, you will often be mistaken for a “nice guy”, because the distinction is lost on all but a few. I think we could use a little more worrying about being polite and a little less worrying about being nice to everyone. I read recently that the Japanese, with their highly developed and intricate system of politesse are considered to be the most polite people in the world. Although I have never visited the country, I suspect that may be true. I do have an intimate knowledge of French culture and can say with a high degree of certainty that while the country of France is not generally known as a country of “nice guys,” the rules of politesse are strictly observed and taught to each succeeding generation. 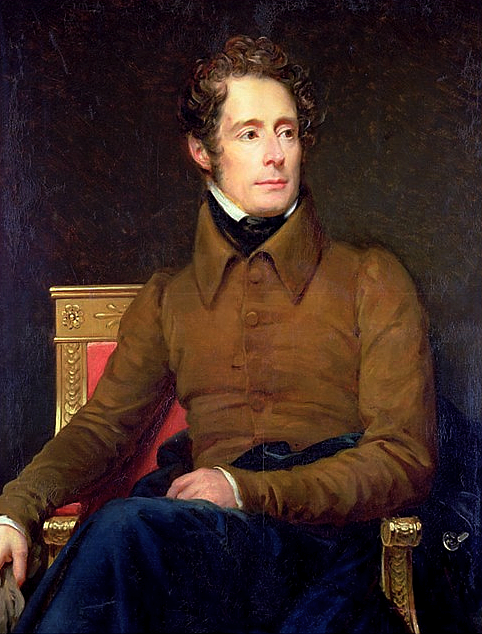 One of my favorite quotes about being polite comes from French writer, poet and politician Alphonse de Lamartine – Argument should be polite as well as logical. I was always taught that it doesn’t cost a thing to be polite, and even if it did it would be worth it. I still believe that to be true. But now I’ve learned that being polite may actually save you some money, at least in France. My friend Mary R. sent me this picture taken in Avignon. Take a look at the prices quoted for a cup of coffee on the terrasse of this sidewalk café. 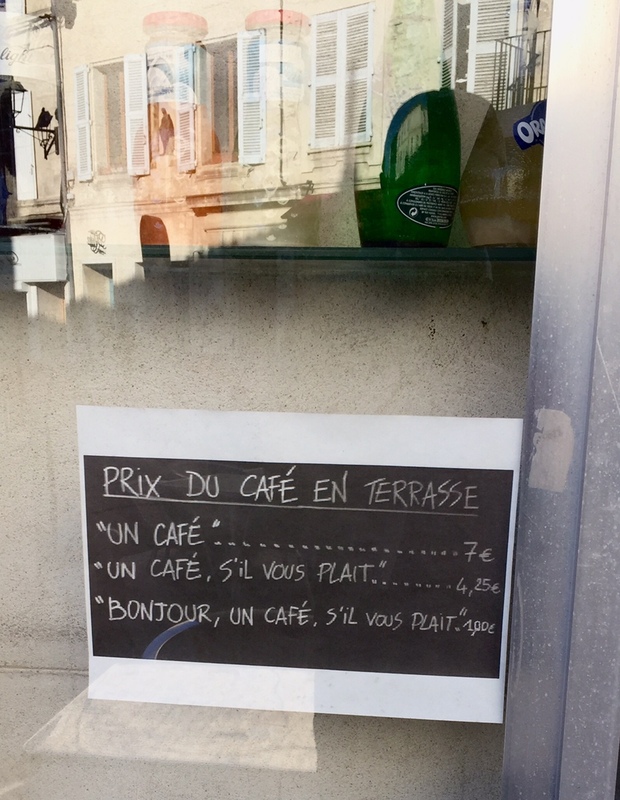 Adding the magic words Bonjour and s’il vous plaît when ordering a café will save you 6 Euros. Or….. maybe you could look at it the other way – not being polite will cost you 6 Euros. 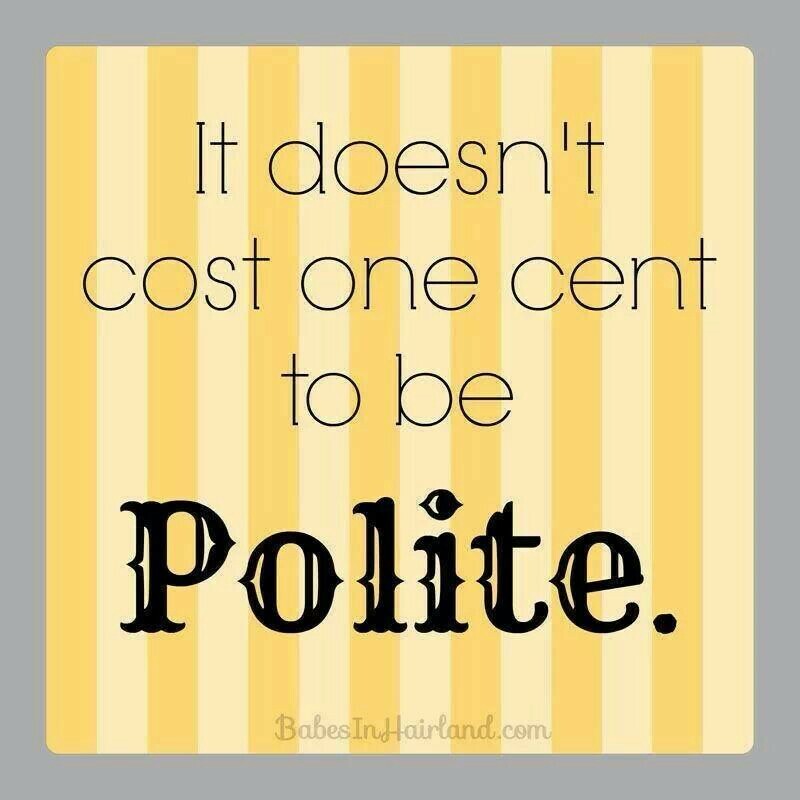 Whatever way you look at it, I say it pays to be polite. I like the similarities between Grandfather George's photo and your nearby photo. I see a hint of mischief in both sets of eyes. 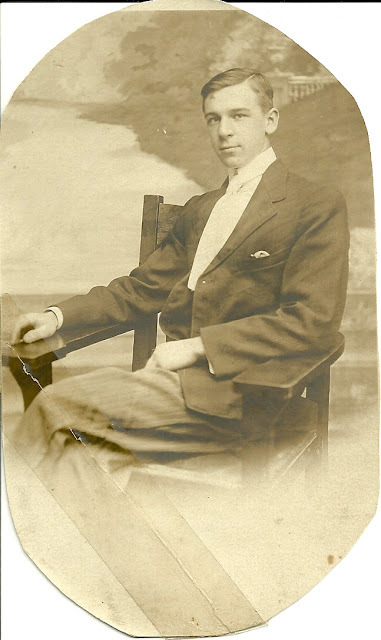 Jo, my Grandfather was a brilliant actor, talented, creative and always a child at heart. Yes, he did have that hint of mischief in his eyes and in his smile. I adored him and miss him to this day. I like to think I inherited some of that sense of mischief (LOL). I agree I notice that when in France the rules of politesse and etiquette are still alive and well. You always say Bonjour when entering the local Boulangerie. The power of those magic words open doors in France, as you well know. They make all the difference. Thanks for stopping by, Josephine. "Being polite does pay, both here and abroad! And so does smiling, even at the clumsy woman who accidentally hits you with her cart while grocery shopping. Thanks for the “polite” reminder." I love that cafe sign! Thanks for sharing. There's a similar sign in some machine/locksmith/mechanic shops. The first rate is if you help. The discounted rate is if you remain present but do not yelp. The third and cheapest rate is if you do neither. Did your grandfather George have a trauma in his past that caused him to drink to excess? He must have worried your grandmother a lot. One of my ex-boyfriend was a sober alcoholic and former coke user. He always seemed rather fragile. I love the idea in that sign that pretty much gives you a monetary incentive to "go away and let us do our job -- come back when we're done." So funny. I don't really know if there was a trauma in George's past. My grandparents (George and Marie) lived through the Great Depression, which was pretty difficult. They decided to leave the professional theatrical world when it was time for my mother to start school, and I don't think he ever stopped missing it. He was a talented actor and professional makeup artist. Marie was also a wonderful actress and had a beautiful singing voice, so she did a lot of musicals. Of course, no one ever "leaves" the theater. The theater stays with you and it came to them. Our house was constantly full of actors, musicians and opera singers, and no out-of-work, down-on-his-luck performer was ever turned away, often staying with us (George and Marie lived w/us.) for months at a time until they got back on their feet or "dried out." Your comment about his drinking was most interesting. We never thought of him as an alcoholic. Everyone drank a lot in those days, particularly the men, and particularly theater people. I don't think Marie thought much about his drinking one way or the other. I do remember my mother complaining about it. She was much more of a prude about certain things than her mother Marie. 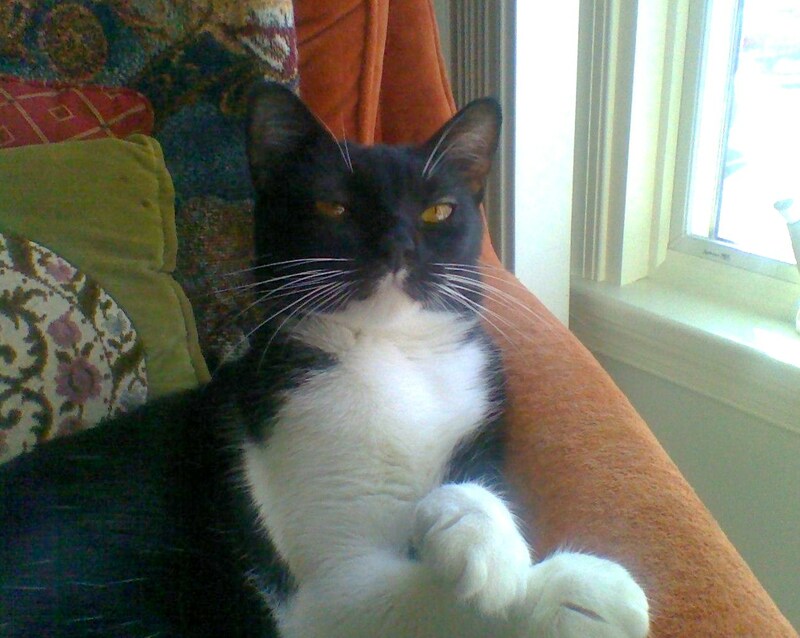 Marie was not much of a drinker but did enjoy the occasional Manhattan. I always got the cherry. Thanks so much for stopping and taking the time to make such a thought-provoking comment. Great post. I have passed on writing thank you notes to my children. I always say to get them done within 24 hours of receiving a gift. 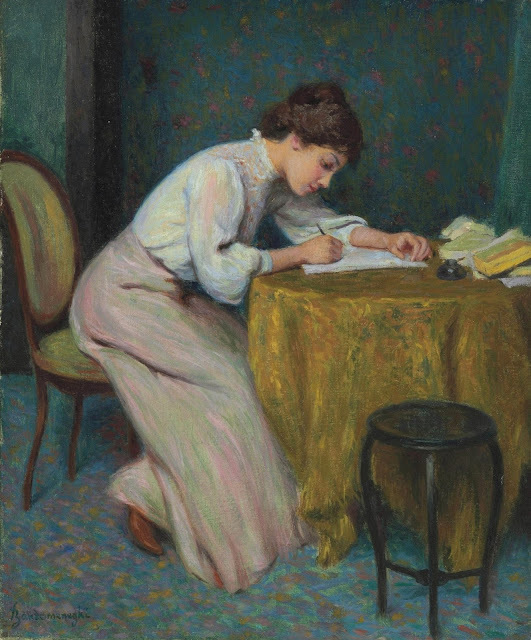 I miss the rituals of hand writing as a way of correspondence. Love your blog too! Glad you enjoyed my post, Cindy. In the interest of full disclosure, I am now rather remiss in sending thank you notes in favor of emails or text messages. I still handwrite notes, but less and less. As a result, my penmanship has suffered. Mind you, it was always rather quirky resulting from French and American influences on my handwriting. The nuns despaired of me in grade school. I love this post! Politeness is so important. So many people are out there looking for something to be aggressive about. Why? I wonder. With young children and politeness, I am often reminded of one of my children who would go out with her Godmother. She would be an absolute angel! Cute! etc. Then when she got home, she would throw a tantrum at me. One day I asked why. "No one can be that good for that long" was her reply. That taught me a lesson too, on expectations of children and their personal limits. As she became a teenager, after the initial wee rebellion, she was grateful that her upbringing was strong on politeness. And, I have noticed, that people who are polite, have an easier time in life. The story you related about your daughter had me absolutely in stitches. What a bright and clever young thing she is. I'll bet you had to do some fancy dancing to stay one step ahead of her!! Adorable! I applaud your efforts to raise a polite child, which have obviously paid off for both of you. Thanks so much for stopping by and leaving such a great comment. What I don't understand in today's world is why people pretend they didn't see you and don't greet with "good morning"
As I walk my dog I pass by the same neighbors that don't respond to my salutation. Such sour-pusses. It's much easier to go through life being plesant. I'm reminded of a Seinfeld episode where Character Ben Stiller remarked " you see a person, you say hello"
Yes indeed times have changed and many respects not for the best. I am so surprised to hear that about your neighbors. I always thought people w/dogs were very friendly w/other dog owners when they walked their dogs, particularly if they see the same faces (human and canine) day after day. That does indeed surprise me, especially since you make a point of greeting them. I remember that Seinfeld episode. Still miss that show. 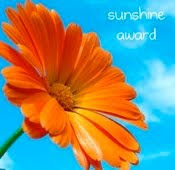 You are the last person who needs a reminder of being nice/mannerly. You are a great example of old world mannerly charm and new world sensibilities, Linda. As always, love it when you stop by and take the time to make a great comment. I've been a bit MIA from blogging since the holidays, but will be catching up w/your wonderful blog. Maybe I should do a follow-up post on that, Deborah. I see being polite as the public me. I am polite to everyone I come into contact with, whether they deserve it or not. Sometimes it has a surprisingly positive effect on people. Being nice is the more private me that opens up to the people closest to me emotionally -- doing the little extra for them, going the extra mile to give them pleasure and make them happy. Does that make sense? I'm interested in your comment that sometimes you feel you're "too nice." Women often feel that way, probably because we tend to put ourselves out for others too much and it is often not reciprocated or even appreciated. Not that we don't love doing it, we do, but sometimes we just feel a wee bit "used." I love your quote by Lamartine! One should put it as motto over many political discussions and talk shows - e.g. we had a very rude remark of a woman who might become our vice-chancellor, Andrea Nahles - she said her programme will be "Eins in die Fresse! - meaning: Pow, right on the kisser!" (but even worse, could not find a better translation) - and media did not say anything against that. Rudeness is ugly, poisons the atmosphere and sets a very bad example for others.